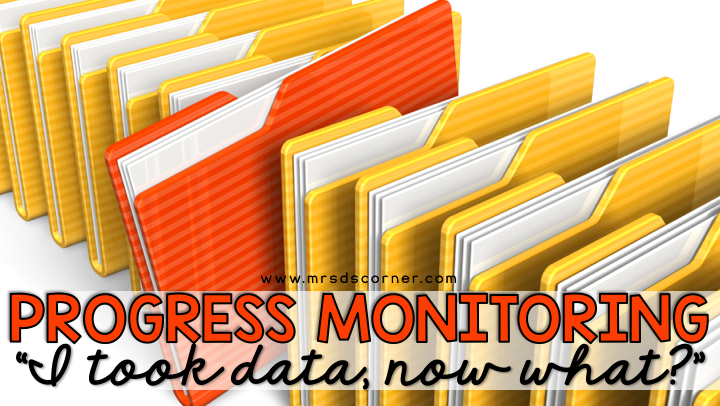 Progress Monitoring: I Took Data, Now What?! Being a teacher of students with special needs, and having taught in so many different school settings and states, I feel like I’m really good at tracking data. 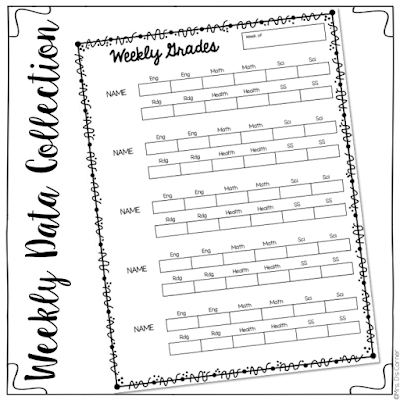 Truthfully, I’m a data nerd – I LOVE collecting data and student progress. Because of this, I’m constantly assessing IEP goal and objective progress. On a weekly and daily basis, I take data in a lot different ways. If you haven’t read the Data Collection for Special Education Teachers blog post, you’ll want to start there. One of the most important data collection sheets is my weekly progress monitoring page. I get asked a lot about this page, and you can finally grab it in this bundle of data sheets. This is where I write down activities the students completed each day of the week and how well they did. 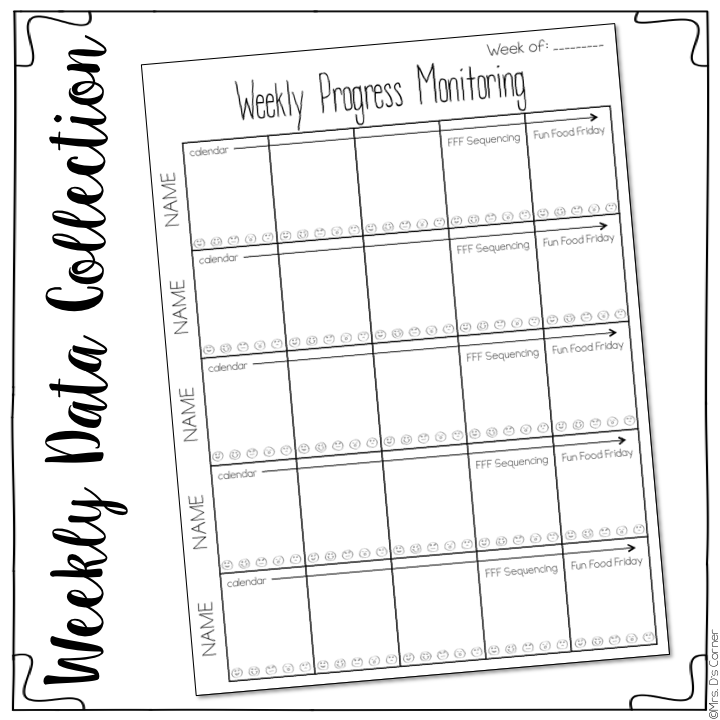 I also use this sheet to keep track of daily IEP goal and objective progress. At the beginning of the school year, I received praise for my use of sticky notes to keep track of data. What this person said has really stuck with me, but I find sticky note data SO easy! If you were to take a look at the back on one of my weekly sheets, you’d probably find at least 8 sticky notes on the back of this sheet, each filled with data collection. Lastly, on the bottom of each daily square is a set of emotion faces. 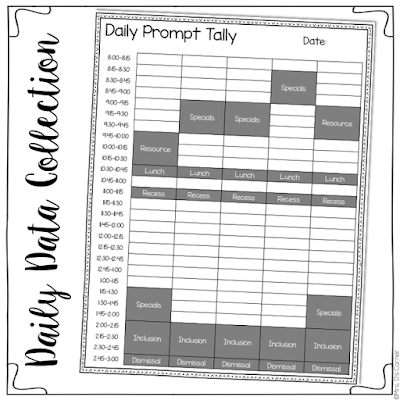 This is something I recently started keeping track of – i.e., student’s daily behavior. Every day I send home daily behavior sheets to parents to let them know how their child did at school. This is a way for me to keep track of how a student did on a daily and weekly basis just incase I ever need to look back on daily behavior. It’s all in one place for me, and we can maybe correlate the behavior with an activity?! It’s just what works for me. Another weekly sheet I use is this grading sheet. Let me preface this by saying I hate doing grades. For my friends who are not on grade level (which is all of them), I feel like it is so silly for me to have to keep track of grades of how they’re performing on a modified grade level curriculum. Hello, they always do well! I think that IEP progress reports are a much better indicator of how well my students are doing, and when I speak with parents about grades, I put more emphasis on IEP goal progress than a report card letter grade. Regardless, I have to take grades on 2 activities in each subject each week. This sheet helps me keep track of grades, that way when I put grades in the Friday before they’re due (or the day, let’s be real)… I can use this little cheat sheet as a quick reference and spend as little time on grades as possible. 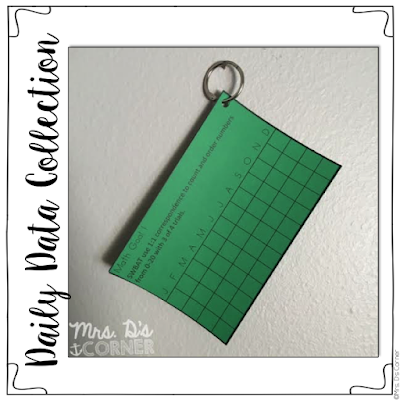 This is a newer daily data collection sheet I started using this school year. In the middle of my second school year in self contained, I lost one of my two paraprofessionals and the district wouldn’t hire another one for my class due to numbers, not the actual need in my classroom. So to build my case as to why I needed another paraprofessional in my classroom, I started keeping very detailed data on prompting… and it’s just something I never stopped doing since. This includes prompting outside of any verbal and physical prompting a student needs that is directly related to the lesson / activity. Again, this data sheet had a specific purpose, but I find the data VERY useful when it comes to IEP meetings and parent conferences. So I’ve never stopped using it. 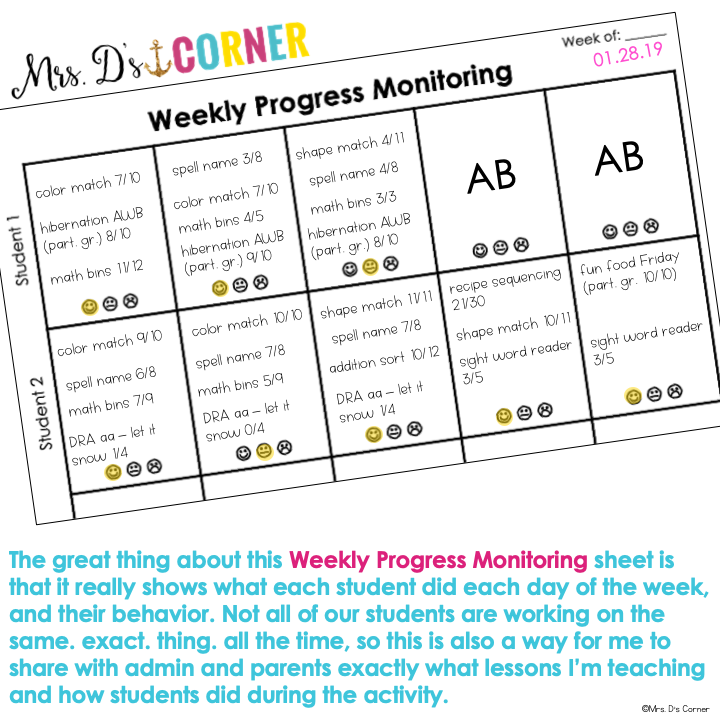 A few years ago, I wrote a blog post all about how I started using my FREE easy progress monitoring binder rings in the classroom that year. 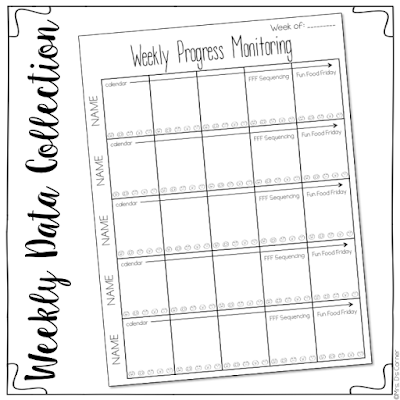 I am still in love with it – it’s the easiest and quickest way I have ever used to track IEP goal and objective data. I use these binder rings directly with the weekly progress monitoring sheet. At the end of every week, I go back and add the data to a student’s binder ring that appropriately correlates with their IEP goals / objectives. If I need more data on a certain goal / objective, I make it a point to work on that skill the following week. When the 9-week marking period ends, I need to send home progress updates on each and every IEP goal / objective. You’d think this would be a daunting task, but with these binder rings, it literally takes hours off of the time it takes me to input data. When it’s time to input data, I just grab a binder ring, flip through each goal and type in the 3-4 data points I’ve collected. Add a few personal notes to each objective, such as a strength with the objective or that we will continue monitoring it until the student is independent. What tips do you have for collecting data? Share them in the comments below! I love the weekly monitoring sheet. I will put a label on it like completed task or goal.